Time for another beautiful project from my Team! We start a new week with Linda's most adorable art journal spread. Feel inspired! Hi everyone, Linda Cain here. I’m thrilled to be on The Team for another session. When I got my box of goodies, the things that caught my eye first were the great Vintage papers and Photos in the Ephemera Packs. I have always loved collecting cabinet cards and photos of unknown people from the past. They just seem to speak to me. So creating these Journal Pages was a real treat for me. The two little girls appear to be about 3 years old or so, hence the number 3 button in the composition. I’ve used lots of the new Mica Powders, so don’t forget to click on the links to see how gorgeous they really are. Let’s get started! 1. I started by completely covering 2 pages in a small journal with Heavy Black Gesso. Some places are heavier than others for the next step. 2. This black background is perfect for adding Mica Powder + Water sprays. I add 2 small scoops in a 2 oz. water bottle sprayer, and shake well. Spray over gesso with several colors while gesso is almost dry. Here I used Gold, Frozen Lake, and Black Cherry. In the heavier painted sections, you can use a bamboo skewer to write into the still damp gesso. 3. I used Antique Silver Crackle Texture Paste and the Lattice Stencil in various areas of the pages. Then I immediately sprinkled lots of Silver Micro Beads and my collective mixture of Glass Glitter and Micro Beads into the Crackle Paste. I save the leftovers from past projects in a little container just for filler. 4. Then I begin to spray more areas to build up the colors. Dry with a heat tool in between sprays. 5. The next layer comes from Stamps and Stenciling with a white paint dabber. 6. I love how the Music Clear stamp created tiny detailed images with the white paint. 7. I added a few Butterfly stamps and splattered white paint across the pages. Now I added Tangerine Mica Powder spray to the pages. 8. 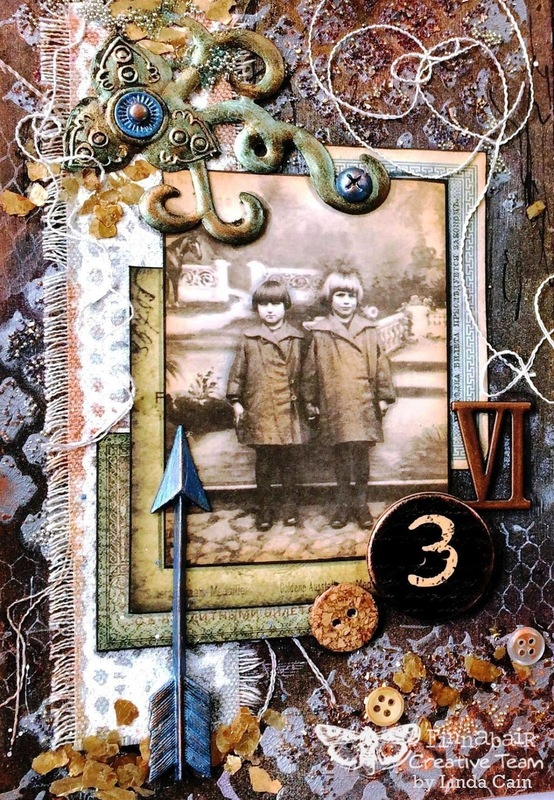 The new Ephemera packs are wonderful for layering up with your Vintage Ephemera images. I always use Distress Inks and pens to add more color to the papers. 9. I tore a strip of Resist Canvas and frayed the edges. Save the pieces of canvas you get by fraying to glue on later. Then I sprayed them with the Mica Powder sprays. 10. Now it’s time to start laying things out on the pages. Some things stay, and some things go… then some things come from my stash to be added as I change my mind. 11. The arrow was painted with Black Gesso and Gold Opal Magic Mica Powder, but it didn’t create enough contrast, so it later got a layer of Summer Sky Mica Powder + Soft Gloss Gel. 12. The Mechanicals Leaves element was gessoed first. Then Copper Mica Powder + Soft Gloss Gel was added. Last a layer of Green Opal Magic was painted on sparingly. 13. A few words are cut and glued around the pages with the leftover strings. 14. The Dream On, Net and Wire, and Now Is the Right Time Cling Stamp collections are used for the background as shown here. Buttons and Gold Leaf Mica Flakes add some more interest, and more Micro Beads are the last layer as filler. 15. A dusting of Copper Inka Gold goes around the edges of the pages and the high points of the pages. I hope you’ve enjoyed my creative journey and are inspired to make pages of your own. As always, share your projects with us on Finnabair and Friends facebook group. We love to see your work! Absolutely beautiful, Linda. You just have such a way of adding layers of texture and color with your art! Absolutely stunning piece. Linda, it´s a fabulous work. FANtastic Linda..so many wonderful details and colours..gorgeous. So, so stunning Linda!!! Amazing background! (Love the idea of scribbling into the wet gesso)! The layering of all the other elements just makes for a perfect composition! Love this big time!! 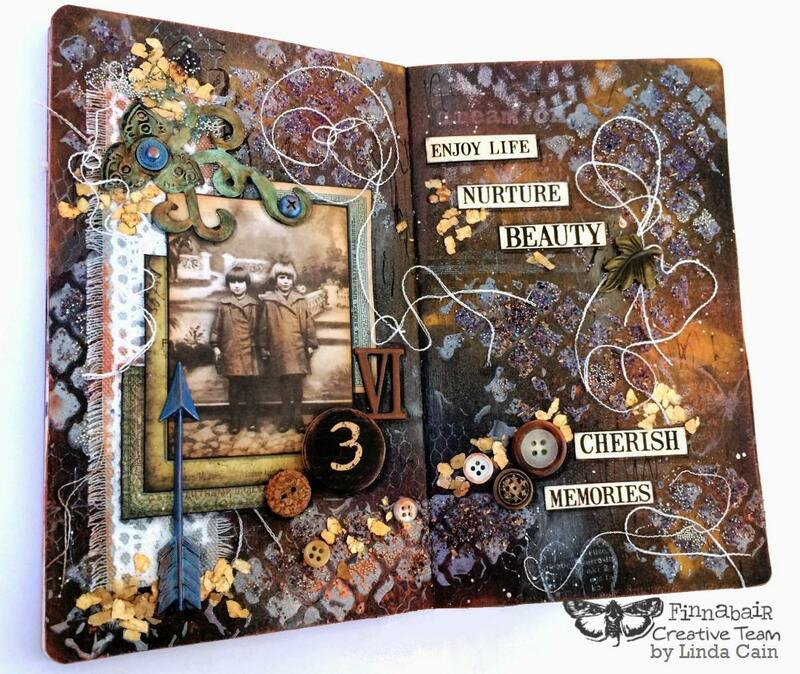 Linda - so gorgeous - wonderful colors, textures and ephemera! Linda, this is absolutely beautiful! Linda your doubble journal page is just awesome. You created stunning texture and fabulous colors. Love the selection of embellishment you used. And your tutorial is just excellent. Thank you for sharing and to take time to write such a detailed step-by-step. You are so talented and I love your work.. Truly lovely art.